Keep user information up to date by running a User Summary report. 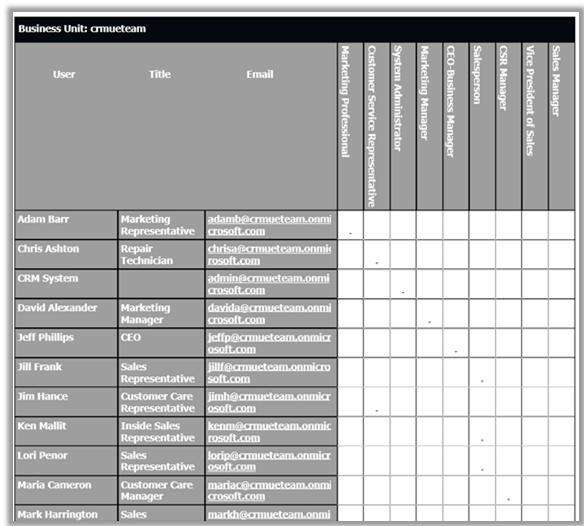 Get a list of all your users, including their contact information and security role in Microsoft Dynamics CRM. Lower support calls and improve your product or service. 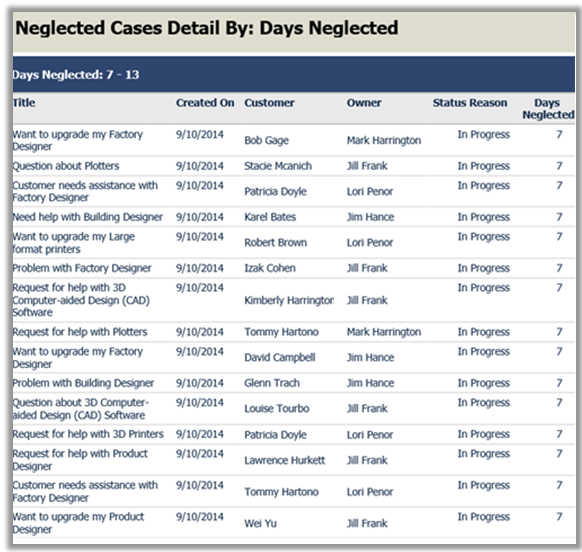 This report tracks service cases and tells you why customers are contacting support. to the team that makes the phone battery so they can fix the issue. This will improve your product and drive support calls down. owner, customer, status reason, product, priority, subject, origin, case type, satisfaction, service level, or severity. Improve your service team’s KPIs and get your cases closed. Quickly identify and take action on cases that haven’t been updated recently. The report also shows the name of the service agent assigned to the case – use this information to follow-up with your team and to start resolving these cases. When you run the report, choose the number of days that cases haven’t been updated. The report shows a list of open cases that have no changes to activities, including scheduled activities and notes. Track the details of your campaign. Get a summary of each campaign activity, including planned and actual time limits, parent campaign details, and definition status. When you run the report, it only displays campaigns with activities or notes that were created within the dates that you specified in the report. Find out which of your marketing campaign was more successful. Use this report to compare the cost effectiveness and number of responses of two different campaigns. When you run the report, select the two campaigns that you want to compare. Find out what’s working and what you need to change in your campaigns. 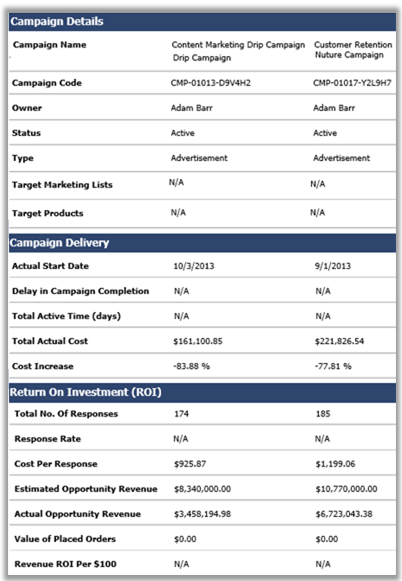 Use the campaign performance report to track the progress and status of your campaigns. The report provides a detailed view of all the dates, targets, definitions, responses, and financial returns from each campaign that has been modified – so you can quickly see the progress of your campaigns. and case resolution. Use the information in this report to look at the details of each activity and identify patterns to make improvements in how you communicate with your customers. Use this report to see which products are used by a contact. For each contact, the report lists the associated products. The report shows orders that have not been cancelled and opportunities that you have won. Get a quick overview of an invoice and its line items to see what was ordered. 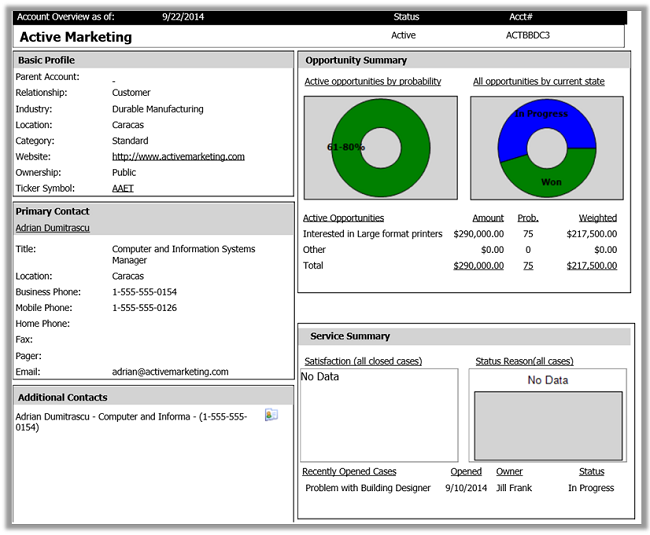 You can also use this report to print invoices. When you run the invoice report, it returns a report of all invoices. You can also select a specific record to get an invoice report for that selected record. Use this report to view your accounts receivable for your active accounts. 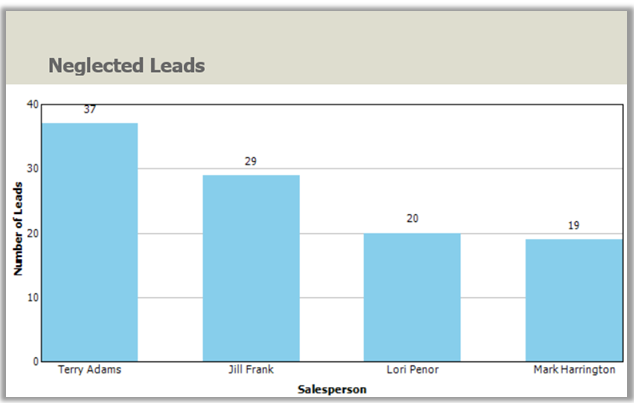 The chart displays the number of invoices grouped by status with the total amount of invoices in each status. Use this report see an order and its line items. You can also use this report to print orders. 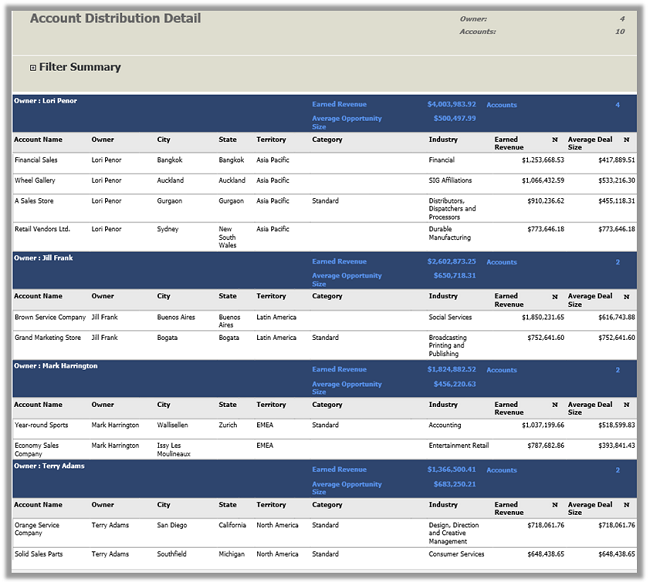 If you run this report from a list without selecting any records, the report generates a customer-ready order for each active order record in the system. If you run this report from within a specific record, the report generates a customer-ready order only for the record you were working with. The report is generated from data that is rolled up to the goals at a set time. If the data is not up-to-date, then wait until the next time the data is rolled up. For more information, contact your CRM admin. 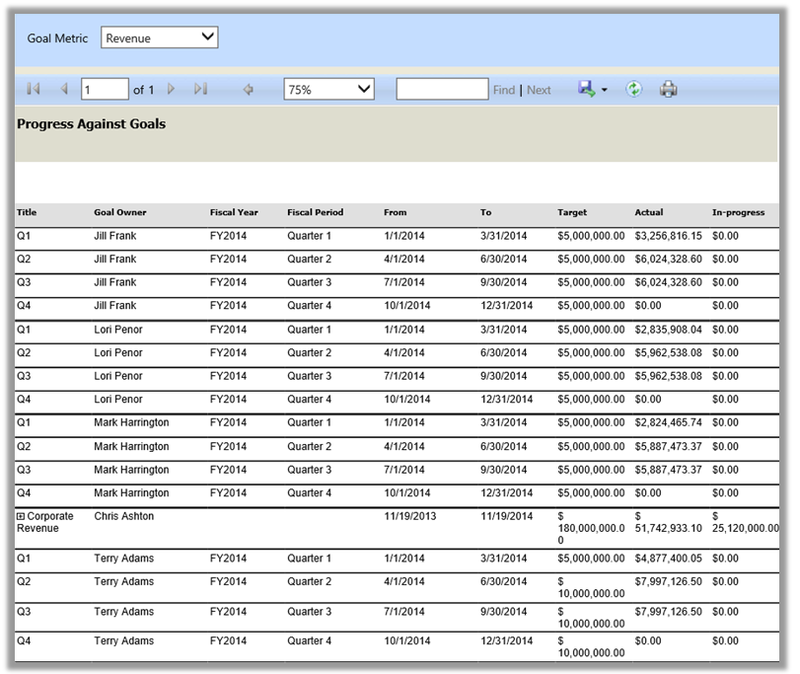 Use this report to view quotes and its line items. You can also use this report to print quotes. 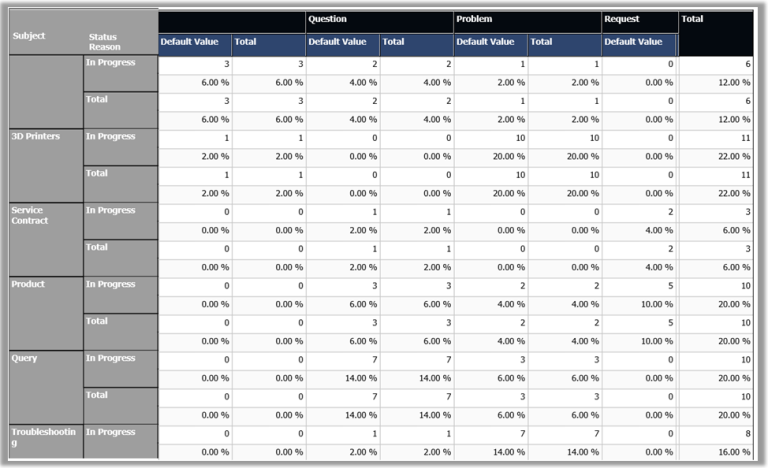 When you run this, results will show a report of all quotes in the system. You can select a specific record to get a report for that selected record. Use this report to review the patterns in service activity volume. The report displays either the duration of or number of service activities grouped by services, resources, time periods, and additional criteria. 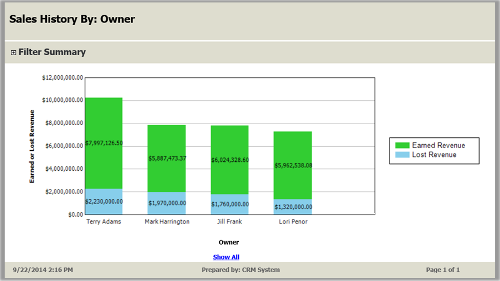 See which account generates the most revenue for your business. Then use the information to identify patterns – so that you leverage the information and apply it to accounts that are not so doing well. This report is generated from revenue based on opportunities that have been won. Get a one-page overview of everything that’s happening with an account. The report shows a profile of the account, contact information, and a summary of opportunities and case activities. For opportunities, the report shows charts with active opportunities grouped by the probability of the opportunities turning into a sale and the state the opportunities are currently in. 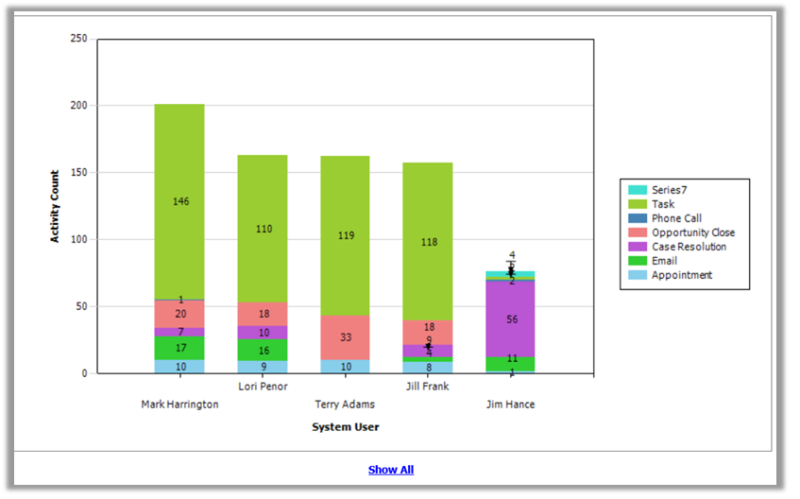 For support cases, the report shows a chart with closed cases grouped by customer satisfaction level and also by the case status. Use this report to see which products are used by an account. For each account, the report lists the products associated with the account. By default, this report displays only line items for orders that don’t have a status of Cancelled, and line items for opportunities that have a status of Won. Use this report to see what has happened with an account. This report also shows what is scheduled to happen in the future. 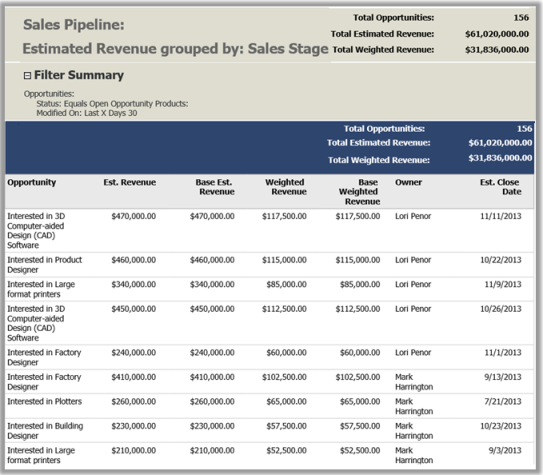 The report displays a chronological summary for an account, including sales and service activities, notes, and records. To view the Account Summary report for an account, open the account record. On the Account tab, in the Data group, click or tap Run Report, and then click or tap Account Summary. Use this report to find accounts that haven’t been contacted recently so that you can follow up on those accounts. When you run the report, select how many days the account has been neglected for. The report shows accounts that have no recent activity, including notes. The information in the report helps you identify which issues your customers are asking about so that you can address those problems and improve your product or service. When a service agent receives a support call or email, the agent searches the knowledge base to see if there is a KB article that can answer the customer’s question. 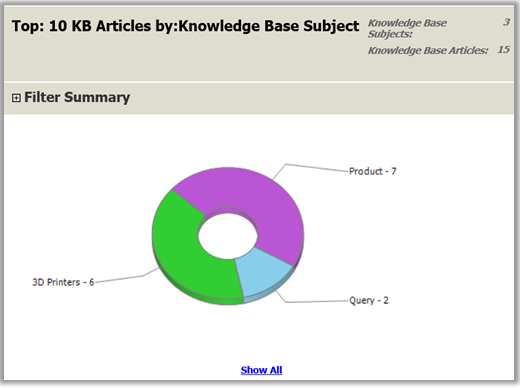 This report tells you which of those KB articles are being used the most. You can change the Group by filter to see knowledge base articles grouped by subject of the article or case, or by the product associated with the case.